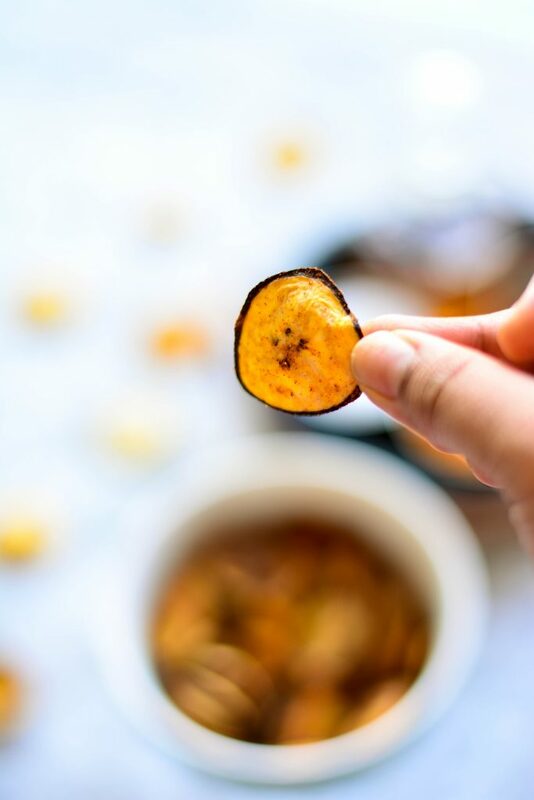 Try these Baked Plantain Chips for a quick and healthier snack, topping or side – crisp, lightly spiced and awesome! Have you had plantains? 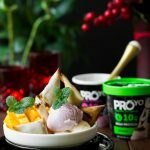 They’re a part of the Banana family, eaten when green, starchier, nutritious and very delicious! 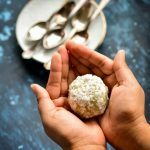 Whether cooked soft with coconut and fennel or fried crisp and seasoned with spices, it’s a very versatile vegetable used extensively all over Asia. 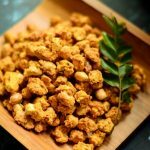 It’s one of my favourite sides to have with a steaming plate of rice and sambar (South Indian lentil stew) – and since it was usually deep-fried, I had to exercise a lot of caution to prevent binge-eating (easier said than done!). 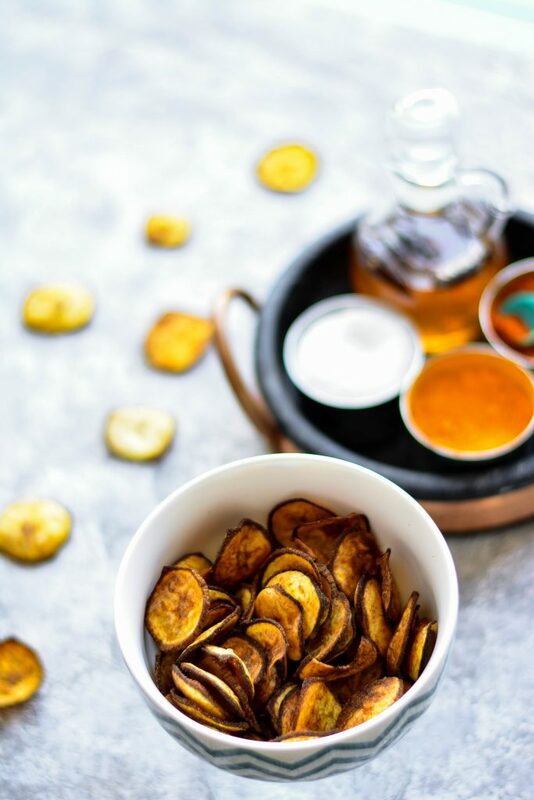 Not anymore – because these Plantain chips are BAKED! Woo hoo! And it doesn’t even take that long, plus there’s no standing over a hot vat of oil, stinking up the house in an oily sheen for days! Ugh, I hate living in carpeted, air-conditioned hell, although, it’s making me deep-fry less and drives me to find baked (healthier) options. So I guess, I shouldn’t really be complaining about that. 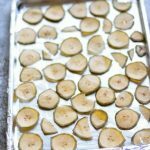 Toss the sliced plantains in oil, season with salt and spices and arrange in a single-layer on a baking tray. If you want, you can just season with salt and toss in the spices after it’s baked! Either way, it tastes great! And voila! 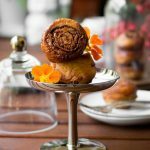 Perfection – crisp, spicy and not doused in oil!! I dare you to not eat the entire batch as soon as it comes out of the oven! Go on, I dare ya! Preheat oven to 400°F/200°C. Line a large baking tray with parchment paper/foil. Peel and slice the plantain using a mandolin slicer or manually - make sure the slices are thin and even. Toss in the oil and season with spices. 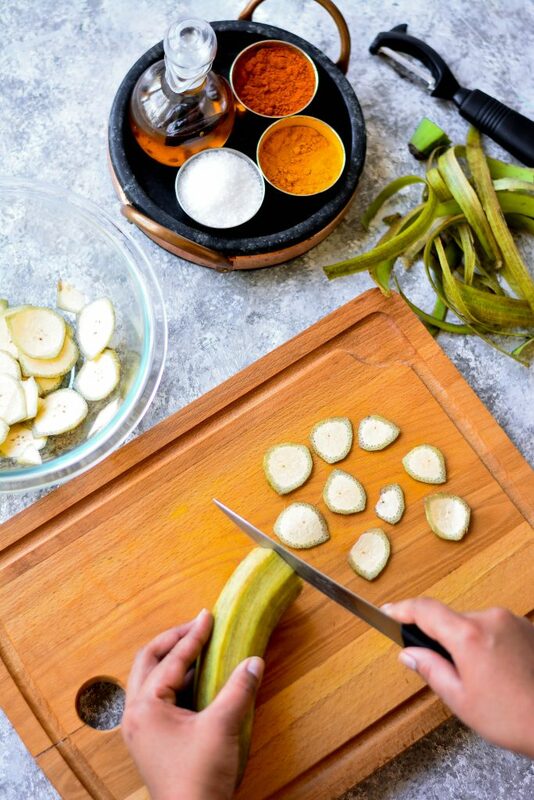 Use your hands to massage the flavours into the plantain. 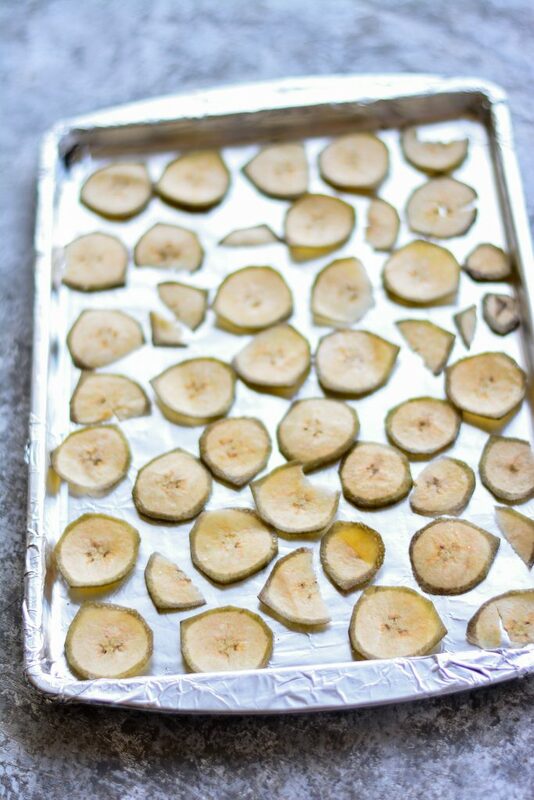 Lay the seasoned plantain slices on the prepared baking tray in a single layer. Bake in preheated oven at 400°F/200°C. for 15-20 minutes, turning it over halfway during baking. Keep an eye on the plantains during the second half of bake time (after 10-12 minutes) - they burn easily. If you see any thin slices turn dark, remove them and continue baking the rest. If there are any 'soft' pieces after 20 minutes, turn off the oven, and leave the tray in to cool inside the oven. They will crisp up in the residual heat. Store cooled chips in an airtight container for 3-5 days. If it goes soft during storage, reheat in a 350°F/180°C oven for 5 minutes and it will crisp back up. 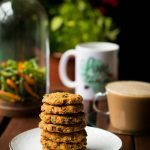 These look absolutely delish and like they’d help with beating the crazy cravings! This is amazing! I’ve never made plantain chips at home because I’m not great at frying things! (Also.. calories). I’m totally going to try this! You’re going to love it, Sarah! I really need to go to one of these African shops and buy some plantains. I’ve never tried experimenting with them, but it’s on my list! You’ll also find them in Asian/Indian groceries, if that helps! 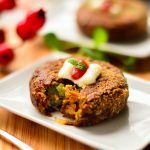 I love how easy you make this recipe seem! I’ve never had a plantain chip but these look very tasty and rather pretty too! And so much more nutritious and healthier than potato chips too! Thanks Colleen! That’s a great idea to bake them, I find many dishes are just as good baked as fried. 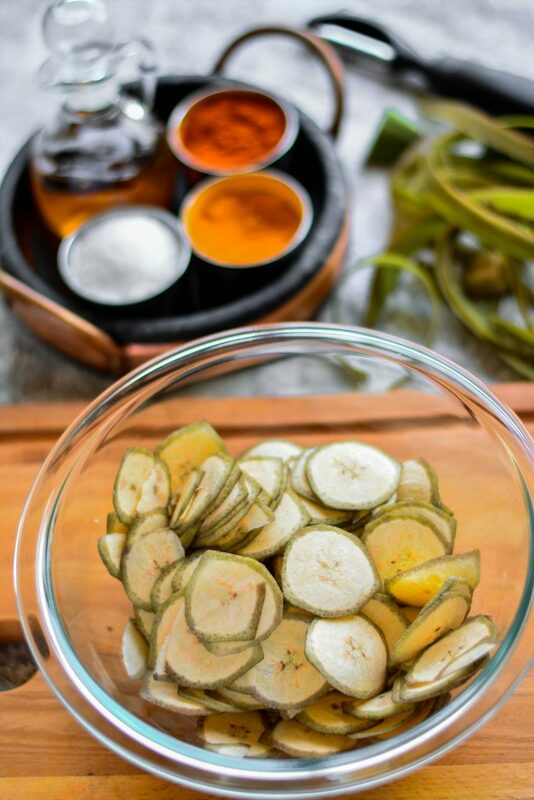 What a great idea to use plantains , I never know what i’d do with them when I see them in the asian grocer. Well, now you know Lizzie! Good luck! I hope you like them!